DIGIBUDDHATM Mini Champagne labels are created exclusively by our in-house team of professional designers. All production, packaging and shipping is also done on the premises by our small team of paper lovers. We truly love what we do and it shows! You're engaged and now you need to Pop the Question to sisters, cousins or your best gal pals asking them to be part of your Wedding Party. These lovely rose, white & sparkling gold "Will You Be My Bridesmaid?" 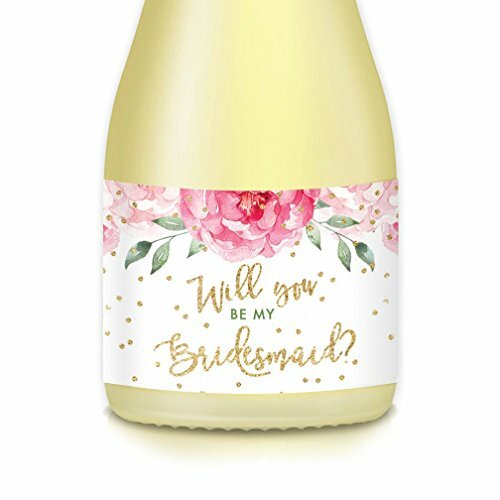 (or Maid-Matron of Honor) mini champagne bottle labels are a delightful way of proposing to Team Bride! All of our mini champagne bottle labels are made using the highest quality water-resistant vinyl adhesive materials. Labels are WATERPROOF and can be submerged for hours with no damage. Digibuddha labels fit on most standard mini-sized champagne bottles. PLEASE NOTE: This purchase is for LABELS ONLY, bottles are not included. ALSO: Glitter on labels is not real glitter but a beautiful high-quality graphic that looks like the real thing - all the bling with no glitter mess on your hands! Please check your bottle size before purchasing these labels to be sure they will fit your needs. Set of 10 (Ten) labels total, with 3 different sayings. Small 3.5" x 1.75" labels, perfectly sized for standard mini champagne bottles. Professionally printed on water resistant vinyl labels. Can be submerged for hours with no damage!